Sell an item on AyosDito.ph and win cash weekly! When the mid-year strikes, shopping is blown wide open for all types of shoppers: fashionistas, techie guys, yuppies and moms! With every brand of clothing, gadget store and specialty boutiques rolling out their mid-year sale banners; the rush to shop until you drop is far too exciting to resist. But where to find the extra cash for shopping is a whole different story. This is where AyosDito.ph whets the appetite of every smart shopper. If you’re looking at a prospect new bag, new pair of shoes or even a grand new haircut, AyosDito.ph brings you the chance to get those and more with the launch of their Post Share Win CASH promo! Instead of breaking the bank or setting your plastic on fire, Team AyosDito.ph invites every smart shopper to sell an item online to win cash weekly! 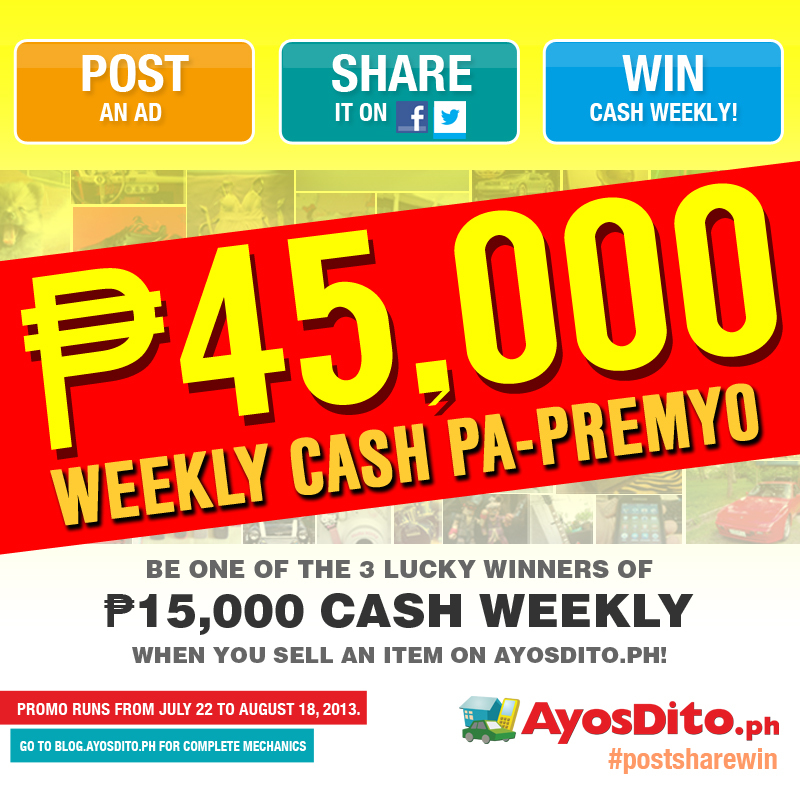 That’s right, for every item you post and share on AyosDito.ph, you get the chance to win ₱15,000 cash every week! 1. Sell an item you don’t need or use anymore. Post an ad on AyosDito.ph! 2. Once approved, Share your ad on Facebook and Twitter using the Share Ad buttons on your ad page. 3. To increase your chances at winning, invite your friends and family to also Share your ads! 4. To further increase your chances at winning ₱15,000 every week, you can post more ads so you can share more ads online! So go home, collect your unused items and sell them on AyosDito.ph! Not only do you get to earn extra by selling items you no longer need; but also, you get the chance to win more cash to shop for new items you want! Your next shopping spree is on us, so start selling items on AyosDito.ph and tell your friends about it! For more information, visit www.AyosDito.ph.